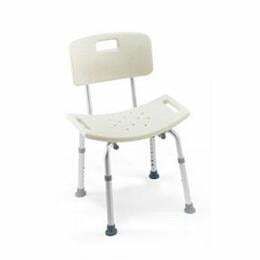 The Invacare Care Guard Tool-Less Shower Chair with Back offers stability and comfort at an economical price. This shower offers wide seat that has handles for transporting the chair. The chair also includes a back that is removable. The shower chairs requires no tools to assemble and it supports up to 315lbs weight capacity. Product Weight Capacity : 315 lb. Seat Surface Depth: 12 3/4"
Seat to Floor Height: 16 1/8" - 22"
Overall Depth: 13 3/4" - 18 7/8"